Thank you Ted for the wonderful review, very kind of you. Peter Rowan/N.R.P.S. are favorites of mine and this plus the nostalgic "Cannabis Cultivar" Panama Red was always my inspiration. If I may make a correction and an expansion, we actually won four 2011 Scovie Awards, you missed the "All Natural" category which we won 1st place as well. To expand on the pepper, we do use the Panamanian origin Aji Chombo pepper, but knew that this being a rare pepper most would be unfamiliar with it and so decided to include Scotch Bonnet and Habanero for recognition. All credit goes to cousin Delvar in Panama City, Panama for staying true to the authentic family recipe. 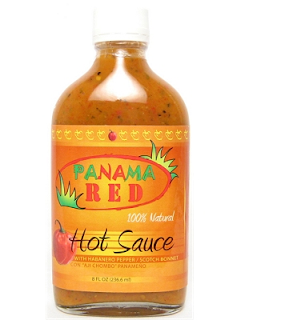 I stand corrected -- Panama Red is a 4 Scovie Winner. As you can tell from the review, I really like Panama Red, and I am happy to know those are real Aji Chombo peppers in there, and not some inauthentic substitute! Tastes very Habanero like to me! But no doubt in an Aji Chombo sort of way.